In Vietnam, plastic bags bear the environmental protection tax rate of VND40,000 per kilo, or VND200-400 per bag (100-200 bags per kilo). MOF believes that the tax rate is too low compared with countries which restrict production and use. The Ministry of Finance (MOF), which advocates the tax increase, said other countries apply relatively high tax rates on plastic bags. In the UK and Ireland, the tax rate is 15 cent per bag (VND4,500), while in Hong Kong it is $0.05 (VND1,050). Estonia plans to tax 2 kroons per bag (VND3,000) while China prohibits manufacture and sales of thin plastic bags with thickness of less than 0.025 mm. The ministry has proposed to raise the tax to VND40,000-200,000 per kilo. The minimum tax rate is equal to the current level, while the maximum tax rate is four times higher than the current maximum level. Will the proposed new tax rates help consumers shift to environmentally friendly bags? 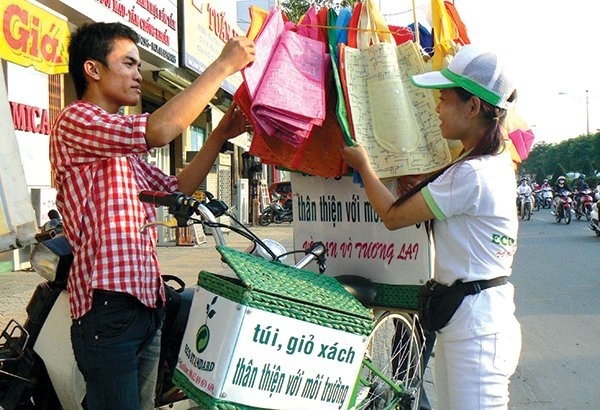 Nguyen Phuoc Dong, director of VafaCo, specializing in making environment friendly bags, said changing consumers’ behavior is a long-term task and that the situation may not change in two or three years. He said 80 percent of plastic bags now available in the market are non-compostable. However, there has been no effective solution to restrict the use of the bags. According to the Vietnam Plastics Association (VPA), though the average selling price of biodegradable bags is VND40,000-45,000 per kilo, which is just 5-10 percent higher than normal plastic bags, biodegradable bags are not chosen by goods sellers. Hoang Van Dieu, chair of Alta, said if the tax rates on plastic bags are raised, opportunities would come to environmentally friendly bag manufacturers. However, he still questions the management over the production and distribution of environmentally friendly bags. As the management is still not tight enough, the quality of products cannot be controlled, so consumers don’t have confidence in products. Dieu said he knows many bag producers who evade tax by labeling their normal plastic bags as environmentally friendly bags. Dieu is optimistic about the business prospects. “In the past, most of our products were for export. But we have focused on the domestic market with 80 percent of capacity,” he said. According to VPA, 30 enterprises have followed procedures to be recognized as environmentally friendly bag manufacturers.